The velvet smooth electronic foot file with diamond crystals Skincare is manufactured by SCHOLL and was added around March 2018. The best price for the Scholl Velvet Smooth Electronic Foot in Kuwait is KWD 13 sold at Lulu Web Store and available with free shipping and delivery within 2 days. 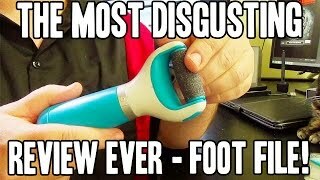 Amazon review video - Scholl Velvet Smooth Wet and Dry Express Pedi Foot File, Blue.